Finally, an easy to do double lift that requires no get ready or finger breaks! An otherwise great card effect can be ruined by poorly executed double lifts. Unfortunately, many magicians telegraph the fact they are going to do a double lift by suspiciously lifting cards from the rear and holding a finger break under them. Just watch some card trick videos and you will spot double lifts in almost every one of them because they are done so poorly. Worse yet, the magician often turns the card over in an unnatural manner. If you think spectators do not notice this, then you are only fooling yourself. Enter Devin Knight's Easy Lift . One of the easiest and most natural looking double lifts ever created. It is a double lift done on the fly in real time. It is not necessary to obtain a get ready break before the lift. In the past, to do a double lift without a get ready required you to master the difficult push off move, in which you attempt to push off two cards as one. It can be done, but it takes months of practice to master, and even then, sometimes you will push off three or four cards instead of the desired two. Another method is the Hit Double Lift that takes some practice to master. Again, if you are not careful you will turn over more than two cards by mistake unless you have really mastered the move. Devin Knight has created a technique that makes doing double turnovers so easy and natural that most magicians will not realize you did a double turnover because you made it look so natural! The deck is held flush and squared in your hand. You flip over the top card and let it fall flush with the deck. No need to injog the card(s) or hold a break under them. This is where many magicians will miss the fact that you did a double lift. You flip the card down again and it has changed. The method is surefire and there is no chance of turning over more than two cards as one. You will marvel at just how clever this move is. How good is this? Just watch the demo video and see for yourself. Extremely easy to do and you can learn it in a few minutes. 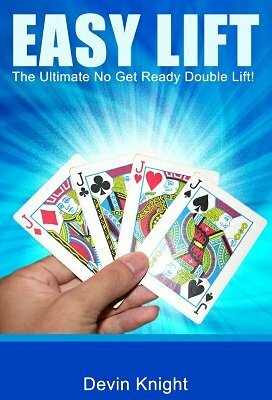 Novice cardmen will find this one of the easiest double lifts to master and will add it to their arsenals immediately. Advance cardmen will appreciate the finesse behind the move and take their card magic to new levels. Once you learn this, it will be the only double lift you will want to use. You will wonder how you ever got along without it. This download is a 90-second video, only 38 seconds of which is the actual explanation. I think potential buyers should know this even though it is a good double turnover. After an accident years back, my fingers don't work too good, and my Double Lift paid big time for it. I had to pretend I was squaring the pack, thumb count and lift two cards at the inner end, and secure a pinkie break before attempting a Double Turnover. Easy Lift has solved this! Within minutes of downloading this, I was performing doubles and trebles as naturally as flipping the top card over! Brilliant! Thank you for sharing this Mr Knight. This is a fantastic double turnover. It looks natural and with a bit of practice you're going to get it down every time, with very little risk of missing. The teaching video is not even 2 minutes long, but he teaches everything you need. This is probably not so good for absolute beginners but everyone else should have this. Even if you already have a double lift you are comfortable with, this is a great one to know. And it's only $3.00! What a great price. Buy now!